I’m here on Kauai again visiting with my husband’s family. It’s usually a very lazy vacation. We have done so many different things on the island after visiting a dozen times. We usually do the same things like go to Poipu Beach, trek to Mahaulepu, get shave ice, eat cone sushi and tons of local fruit. Most of the vegetarian/vegan eateries are in Kapaa and my husband’s family lives off Omao Rd in Koloa. When the speed limit around the island is usually no more than 40 MPH, it takes a while to get places. Traffic in Kapaa in the afternoon is no fun too. So we only trekked up the eastside to do one Bikram Yoga class. Our attempts at eating were not successful. I wanted to try Gopal’s Creperie but it was closed. We also tried to eat at Shivalik’s Indian restaurant but unfortunately the waitress was also the hostess, bus boy, and manager of some underage helpers. We ended up eating at Kauai Pasta which was OK. The highlight of our food this trip was Christmas dinner that was cooked by my sister-in-law who lives in London and also just simple local fruit. 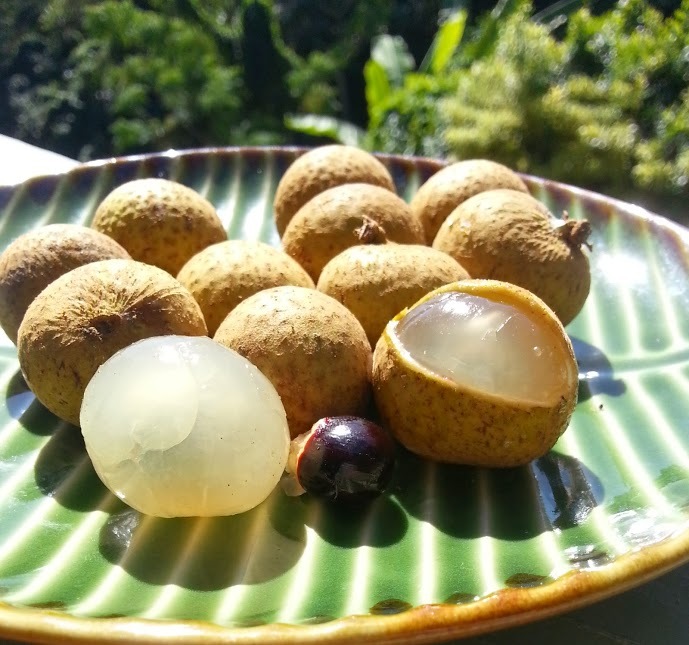 Here’s a pic of some longan fruit that we picked up. It is very similar to lychee and quite easy to eat. You can try to peel it or take a small knife and make a slit. Then press out the little jelly-like fruit into your mouth and eat it. There is a black seed inside that is inedible. We are off to hike the Hanakapiai Trail on New Year’s Day! Have a Happy New Year and I look forward to being back in Austin soon!